Another zucchini recipe (tomatoes too! ), this one from the Pampered Chef. Bob went and picked the zucchini right from our garden. This is one of our favorites. Heat oven to 400. Roll pizza dough out to desired shape. Bake crust for 7 minutes. Remove from oven. Slice onion, zucchini, tomatoes and mushrooms. Press garlic over crust and spread evenly. 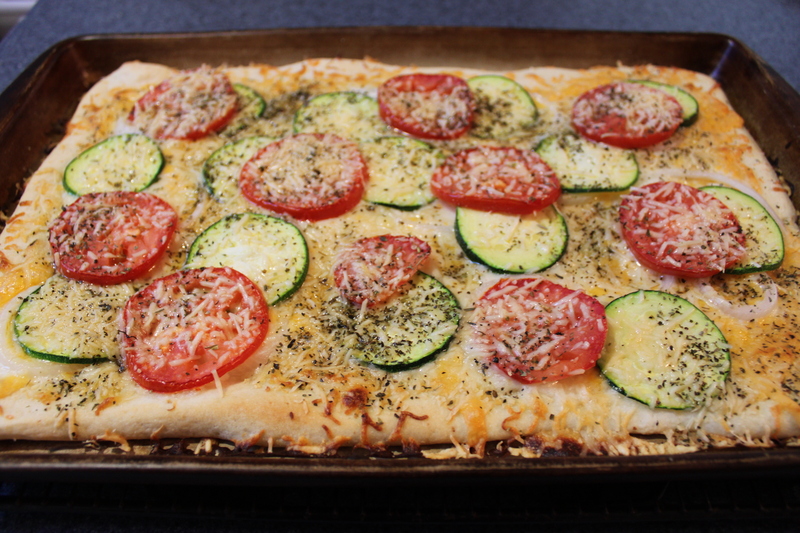 Sprinkle mozzarella and cheddar cheeses over crust then top with onion, zucchini, tomatoes and mushrooms. Sprinkle with Parmesan and then seasoning. Bake 15 – 18 minutes or until crust is golden. Sound really yummy. we will give it a try. Wow, those look really good! Will have to try them. Thanks!